Kaos GL has taken Ankara Governorship’s ban on LGBTI+ events in Ankara for an indefinite time period to the ECtHR. Stating that European Convention on Human Rights, especially the right to assembly and right to association, has been violated, the association demands that the court issue injunction. Kaos GL Association has taken the “indefinite ban on LGBTI+ events” declared in November 2017 to the European Court of Human Rights (ECtHR). ECtHR application has been made after Kaos GL’s request for injunction against the governorship decision from Constitutional Court (CC) was rejected. On behalf of Kaos GL Association, Chair of the Board and Lawyer Yasemin Öz, Lawyer Hayriye Kara and Lawyer Kerem Dikmen stated that after the last rejection of CC domestic remedies were over. Kaos GL is expecting that ECtHR will take a priority decision and issue injunction on Ankara Governorship ban. The association appealed for the halt of the decision right after the ban. After Ankara 4th Administrational Court rejected the appeal, the association applied to CC on the grounds that the decision violates the freedom of expression, right to form an association and right to assembly. The association also stated that this is an obvious discrimination and violation of right to a fair trial. Due to the fact that violation of the rights would cause unrecoverable results for the association, Kaos GL requested from CC to issue injunction against the ban decision of Governorship. However, CC rejected the injunction appeal. CC has not decided for the ban yet. Kaos GL stated that the ban declared indefinitely on the grounds of “social sensitivities and sensibilities”, “public security”, “protection of public health and morality” and “protection of rights and freedoms of others” violates some European Convention on Human Rights (ECHR) provisions. 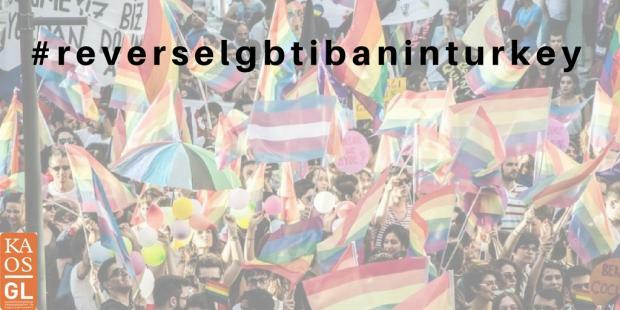 The association indicated that after the Governorship had been informed about potential attacks on LGBTI+ events, they banned the events instead of taking any action against the potential threats. Stating that this violates the provision of ECHR on degrading treatment, Kaos GL emphasized that state does not fulfill its positive obligations in terms of degrading treatment. Kaos GL also underlined that right to respect for private life and freedom of expression as the provisions of the Convention have also been violated. Reminding that in spite of all rights and freedoms has been suspended provisions deprived from international law must be fulfilled, Kaos GL emphasized that discrimination cannot be justified with state of emergency situation. Indicating that the ban decision reinforces the prejudices and discrimination in society, Kaos GL emphasized that the ban violates the prohibition of discrimination provision of the Convention.